We had a vested interest in seeing Orange, having spent a lot of quality time loitering around the shoot as it took place in Melbourne. The lure of seeing Ram Charan on the big screen, along with the ever entertaining Genelia and our hometown was just too strong to ignore. We avoid reading previews of new release films before we see them, as there is too much PR hype and politics to get much useful information, but the arrival of Charan on Twitter certainly got our attention! The cinema was full, and with a higher number of families and kids than we usually see at the South Indian films here. Charan plays Ram, a wildlife photographer and graffiti artist with a truly excellent selection of t-shirts. He lives with his sister and brother-in-law in a fancy apartment and drives a flash car. He has strong views on love and honesty and won’t back away from his values. After an earlier relationship with Rooba (Shazahn Padamsee), shown in flashback, we see that he learned a lot about himself and what he wants from life. He doesn’t believe that simply saying ‘I love you’ makes for a relationship, and doesn’t believe it is honest or realistic to promise a lifelong love. He is affectionate, caring, demonstrative, but he is not going to commit to a lifetime, and he will not sacrifice just to keep his loved one happy. He doesn’t want his girlfriend to sacrifice anything for him either – he has been through this unhappiness and is genuinely trying to find an honest and respectful balance. Genelia as Janu makes a ridiculously chirpy entrance to the film, cheering as she watches a marriage proposal and being as excited for the lovers as if it was her own relationship. She does believe in the idea of soulmates and lifelong love connection and wants that from her partner. She is in love with love, and looking for Mister Right. Several potential Mister Rights form part of the comic sideplot. So of course, these lovely looking youngsters with completely opposing views fall for each other. The film is then about Ram and Janu getting to understand each other, and the choices they make. With Puppy (Brahmi!) aiding and abetting Janu, the relationship develops in fits and starts. Ram is persistent and Janu is interested but wary of this charismatic suitor. We knew long before Brahmi mimed Krishna playing his flute that Ram was a ladies man! When he happily admits to having had NINE girlfriends, in relationships spanning from 1 to 387 days in length, Janu decides he is just too much to handle and tries to back off but cannot deny her feelings. Although for the most part the film is a fluffy romance, there is a serious conflict at the core. While the audience can empathise with both sides, it is clear that something major would have to change for there to be a traditional boy gets girl happy ending. We could maintain sympathy for both the romantic Janu and the more challenging Ram so found the conclusion to be reasonably satisfying and in keeping with the characters. However we suspect that if you can’t connect with Ram’s character, the film will not hold your interest. Charan’s performance was great. He was charming, funny, energetic, emotionally engaging and totally looked the part. He was convincing as the school leaver Ram, and especially as the urbane young man about town and his body language really suited the different confidence levels of these stages of his life. The fight scenes were typically dramatic and physical, and Charan’s dancing is, of course, brilliant . 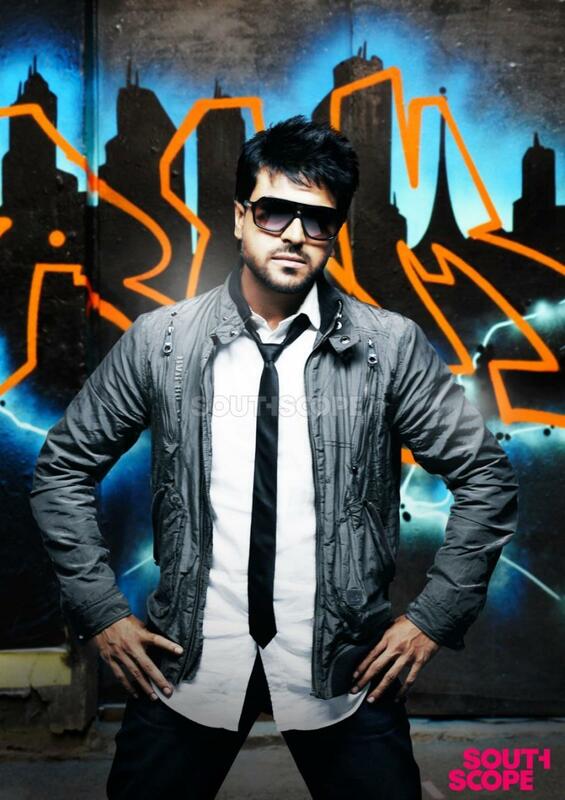 The choreography was lots of fun and Charan seemed to have a great time sending up some cheesy romantic moves. Seeing these films without subtitles and having only a minimal understanding of language, we rely on the tone and expressions of actors. Charan made us see him as Ram and we understood his character’s views and feelings so we have to say it was a successful performance. Genelia was her usual bubbly self, perhaps too bubbly, to start with but really showed some depth to Janu over the course of the film. She conveyed the struggle between having feelings for someone and knowing that it wasn’t going to work. We could see her grow from a carefree girl to a more independent young lady as she confronted her own beliefs and tested them for herself to see what she wanted. Nagendra Babu had a small but pivotal role as Ram’s neighbour who was living in a stormy domestic situation. Brahmi and Prakash Raj are always a familiar delight to behold. Brahmi got more to do in Orange , and his comedy was a bit more varied and often very funny. He also had a fine collection of t-shirts, and a habit of reading Mills & Boon before bed. Prakash Raj was the Telugu cop who gave Ram the reason to narrate his life story. He had little to do, and really it need not have been a Prakash Raj role although we are always pleased to see him. We did watch some of the scenes with him and Charan being shot so we certainly enjoyed that. The rest of the support cast were fine but as we have to concentrate on the main story, we didn’t really give them enough attention to be able to comment much. We love the soundtrack and the songs looked amazing on screen. We are somewhat disappointed that Melbourne scenes are inter-cut with Sydney to give the impression of one Australian city, as the Melbourne -Sydney rivalry is HUGE, but we will forgive it as we got the opportunity to watch this film being made. Bhaskar managed to skirt the problem of geographic displacement by blending the locations well. The places Ram and Janu were seen were appropriate for their student lifestyle and helped the film’s credibility. We are always a bit judgmental about the skankily dressed white chicks in songs but Orange is family friendly for the most. Some special notes: We greatly enjoyed Anand Ranga’s updates via Twitter, and shared his anxiety about the weather. When he casually mentioned filming with a lion, we expected maybe a fleeting appearance in a song. Not a full blown encounter with the King of the Jungle who apparently frequents the NSW forests. We cheered a lot! But the audience went wild when the Glen Iris tram was on screen – who knew the number 6 tram was that much of a star? We also enjoyed seeing a return of the pink panda t-shirt first spotted on Charan in Magadheera, this time being worn by one of Ram’s friends. There was plenty for the alert viewer in Orange! This entry was posted in Tollywood and tagged Adventures without subtitles, Anand Ranga, Bhaskar, Brahmi!, Charan, Genelia, Harris Jayraj, Nagendra Babu, Orange, Peter Hein, Prakash Raj, Ram Charan, Shazahn Padamsee, Telugu, Tollywood. Bookmark the permalink. Uh-oh… I think you said some not so magic words for my ears: “Genelia was her usual bubbly self, perhaps too bubbly”. Ugh… I hate bubbly Genelia. That aside, it sounds like this is actually an interesting plot, and you’ve made a pretty solid case for watching it for the plot rather than all the other reasons, so now I’m looking forward to it. 🙂 Thank you! I felt like running out of theatre during first 10 minutes of Genilia entrance ( the way her charecter behaves is as if she came from some mental asylum. i felt this is more of Director fault then her fault) . later on her charecterization is ok.
another pointless thing in Orange movie is parachute fighting (out of all).Arya2,khaleja and Orange may not work(worked) commerically but these movies will be remembered for long time I think for their content. I love Orange! It’s one of the best love stories to have come out in a long time. I loved everything about the movie except for the confusing and abrupt ending. I think it didn’t fare well commercially because I don’t think many people connected with the character of Ram. Telugu audiences are usually used to uncomplicated love stories and this was much too straining apparently. This is my favorite ram charan movie after magadheera. Unfortunately it didn’t do well at the box office. For once I found a telugu movie that posed a problem, but didn’t offer any simplistic solutions. So is it mostly filmed in Melbourne? I thought it was filmed in sydney when I saw the sydney opera house and not to mention the song ‘sydney nagaram’ . What kind of rivalry is there between sydney and melbourne? Is it sports related?